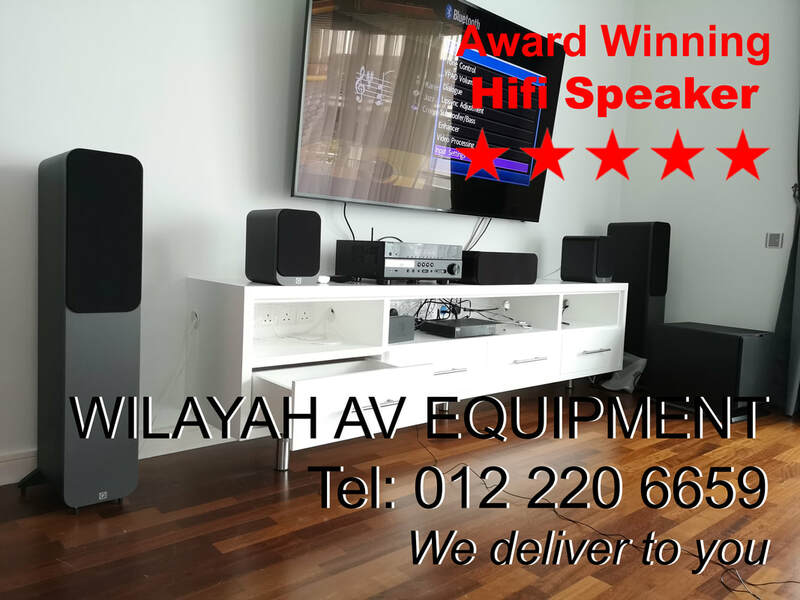 The award winning home theater system in Malaysia - Wilayah AV Equipment, your home theater system and hifi sound system dealer in Malaysia. The Q Acoustics 3000 series 5.1 home theater system is a popular modern 5.1 channel system. 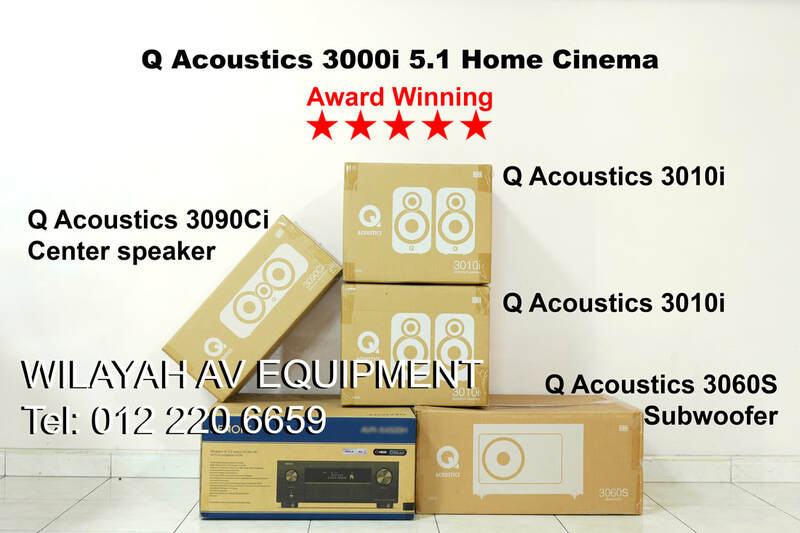 The Q Acoustics 3000 home theater series consist of Q Acoustics 3050 for front speakers, Q Acoustics 3020 for surround speakers, Q Acoustics 3090C for center speaker and the subwoofer is Q Acoustics 3070S, and the best part is these are award winning home theater system made to be affordable. With its modern good looks, striking colors, its suitable as corporate gift, or Valentine's gift, birthday gift or Christmas gift. These talented speakers are recommended for music too. 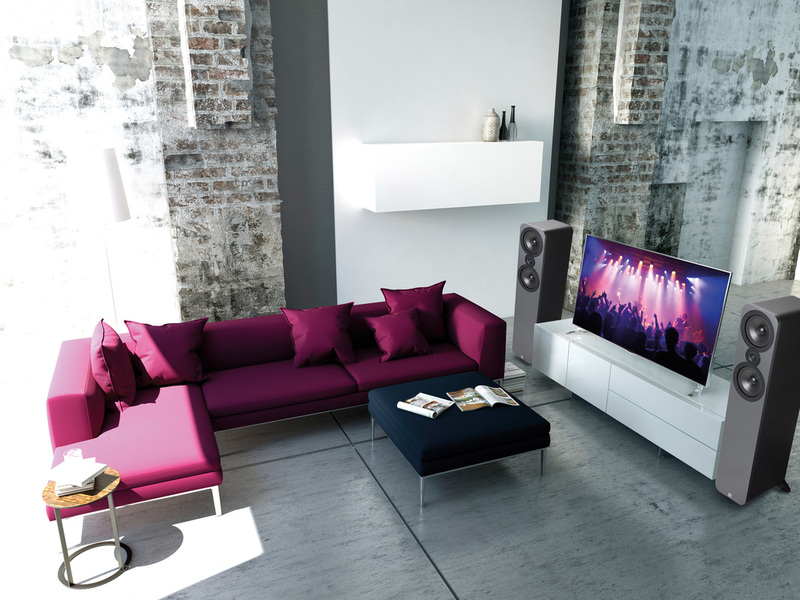 Modern looking home theater system that compliments your interior design. The Q Acoustics 3000 series 5.1 home theater system is an amazing award winning system and the price will amaze you even more. For the audio quality, built quality and design, Q Acoustics is comparable to products 2 times its price. With Q Acoustics products, if its good for music, it is good enough for movies. Q Acoustics has the full range of 5.1 home theater system and more. For an immersive experience, consider Q Acoustics 7.2 home theater system consisting of Q Acoustics 3050, Q Acoustics 3020, Q Acoustics 3010, Q Acoustics 3090C and 2 units of Q Acoustics 3070S subwoofers. Q Acoustics 3000 series 5.1 paired to a Yamaha. During testing, we set the receiver to 120Hz and the Q Acoustics 3050 were pumping out plenty of solid bass. However, since there is a subwoofer, so we let it do most of the low frequencies then. For more details or to make a purchase, kindly call us. Q Acoustics 3000 series is a combination of Q Acoustics 3050 as front and Q Acoustics 3020 as surround and a "tall & slim" design Q Acoustics 3070S subwoofer making it an award winning home theater system and the best home theater system available for sale now. This is the Q Acoustics 3090C center speaker. With two of the new 100mm, Aramid Fibre/Paper cone bass drivers, and the new 3000 Series wide dispersion, concentric Ring Dome high frequency unit. The 3090C acoustically matches and complements any of the 3000 Series models. Removable rear port bungs means it can deliver its outstanding, seamless performance whether it is bookshelf, stand mounted or wall mounted by using the dedicated 3000WB wall bracket. Q Acoustics 3010 is small and powerful for its size. It is the smallest bookself speaker in the Q Acoustics 3000 series. 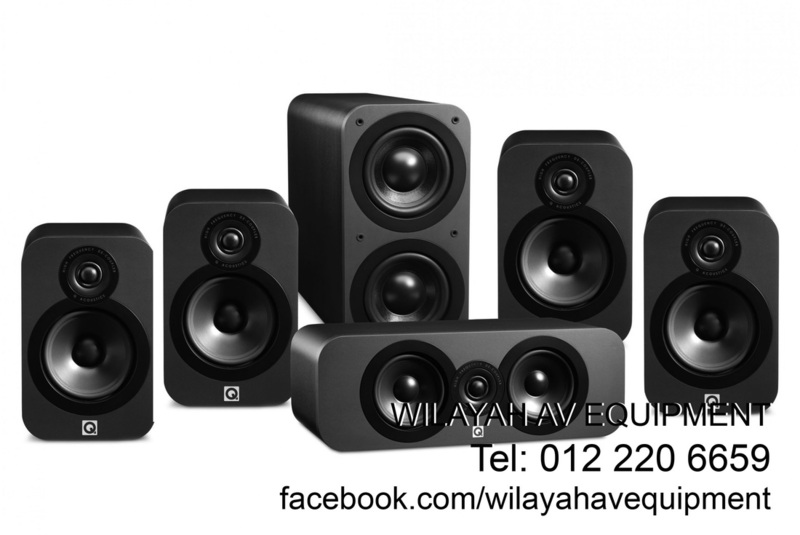 Its ideal for a small room and recommended for home theater system surround speaker too. Q Acoustics 3010 is small and powerful. google Q Acoustics 3020 is the much talked about new hifi speaker. 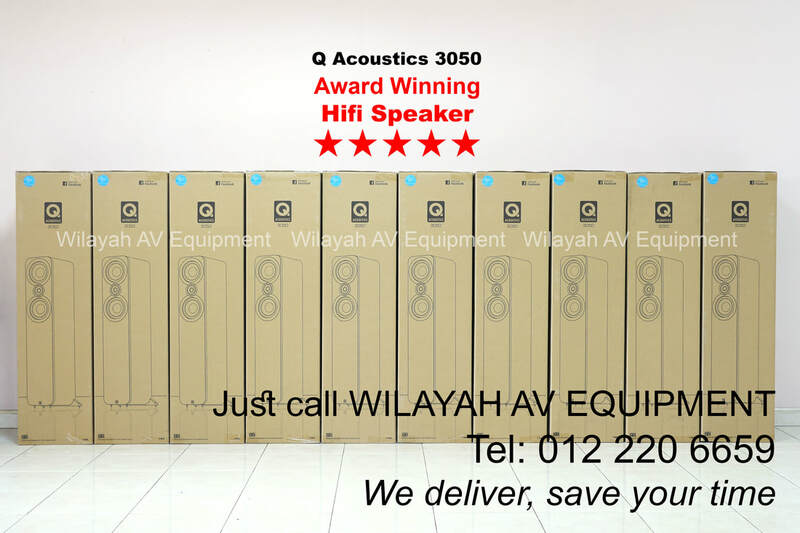 The Q Acoustics 3020 is smaller than the Q Acoustics 2020i and retain the company's high standards in cabinet constructions. The Q Acoustics 3020 hifi speakers deliver a wide, deep soundstage populated by nicely layered and precisely focused instruments. We’re impressed by the dynamics on offer, as the 3020s deliver the music’s crescendos with confidence, while rendering low-level subtleties with a skill quite outside the scope of most rivals. The Q Acoustics 3020 speakers will give you a quality of sound that’s well beyond the typical expectations of a sub RM2000. Is the Q Acoustics 3020 a fabulous value? Without a doubt. The Q Acoustics 3020 truly shines when push to higher volume. Q Acoustics products are avaialable now. The Q Acoustics 3020 hifi speaker sounds good, looks good and is good value for money. So is Q Acoustics 3020 the best hifi speaker? Q Acoustics 3020 is among the best affordable hifi speaker. The Q Acoustics 3020 hifi speaker is also an ideal choice for small home theater setup. It’s for sale now, make a purchase and have it delivered to you. We deliver nationwide. Award winning hifi speaker Q Acoustics 3020 is made to be affordable and good value for money. It is the best stereo speaker for its price. The Q Acoustics 3050 is a very good all-rounder floorstand hifi speaker for your hall. The award winning Q Acoustics 3050 floorstand hifi speaker is a modern well-built speaker and is ideal for music and movies. The Q Acoustics 3050 is so musical it makes you wants to listen to background muisc in movies. The award winning Q Acoustics 3050 floorstand hifi speaker is a modern well-built speaker for music. The clarity is with details and with a dose of tenderness and will never be harsh even volume is high while mid bass and bass is punchy and tight and satisfying. Match it with any Denon or Marantz amplifier and she will sing to you. Q Acoustics 3050 is ideal for music and movies. 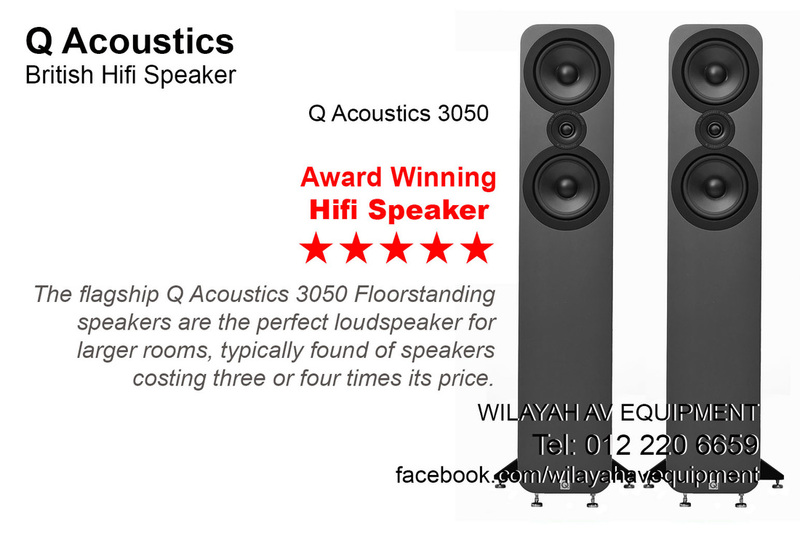 The Q Acoustics 3050 is so musical it makes you wants to listen to background muisc in movies. The Q Acoustics 3050 is a well designed and engineered award winning floorstand hifi speaker. The flagship 3050 floorstanding speakers are the perfect loudspeaker for larger rooms, typically found in speakers costing three or four times its price. Q Acoustics 3070S with dual woofers is a "tall" design subwoofer ideal for small space. Q Acoustics 3070S subwoofer is recommended for used in most home theater systems, and can also radically improve the sound of stereo systems. The Q Acoustics 3070S subwoofer can provide a foundation to the sound that few speakers can muster on their own. So adding a Q Acoustics subwoofer is not just about adding more and deeper bass, rather, a properly integrated subwoofer can improve the overall sound of the system. Q Acoustics 3070S subwoofer is recommended for used in most home theater systems, and can also radically improve the sound of stereo systems. The Q Acoustics 3070S subwoofer can provide a foundation to the sound that few speakers can muster on their own. So adding a Q Acoustics subwoofer is not just about adding more and deeper bass, rather, a properly integrated subwoofer can improve the overall sound of the system. Q Acoustics 3070S is a rather tall and slim subwoofer that would easily fit into a tight corner of a condo or office while providing punchy and powerful bass. For more details or to make a purchase, kindly call 012 220 6659. We deliver to you, save your time. Here is another setup of 2.1 Q Acoustics system consisting of Q Acoustics 3070S subwoofer on the left and Q Acoustics BT3 on the right, Noticed the narrow the space available for the subwoofer? Probably will not be able to fit the usual square box. The system is connected directly to the TV via optical for Netflix and Youtube playback. For more details or to make a purchase, kindly contact 012 220 6659. We deliver to you. Q Acoustics 3020 American walnut color. Q Acoustics 3000i 5.1 home cinema package is suitable for condominium or small office. For more details, kindly call us. Q Acoustics 3020 and Q Acoustics 3050 neatly packed before being delivered. The Q Acoustics home theater system is the most affordable and among the cheapest for its grade. Q Acoustics home theater system is well designed, well built, reliable award winning speakers and is the best value for its price for long term investment. Q Acoustics 7.1 home theater system. This is a versatile system suitable for movie and movie. For more details or to make a purchase, kindly call 012 220 6659. We deliver to you, save your time. Yay! Another day another proud owner. We will be setting up for a customer Marantz 5012 + Q Acoustics 5.1 home theater system consisting of the award winning Q Acoustics 3050, and award winning Q Acoustics 3020 and others. If you are interested to find out more, or to make a purchase, kindly contact 012 220 6659. 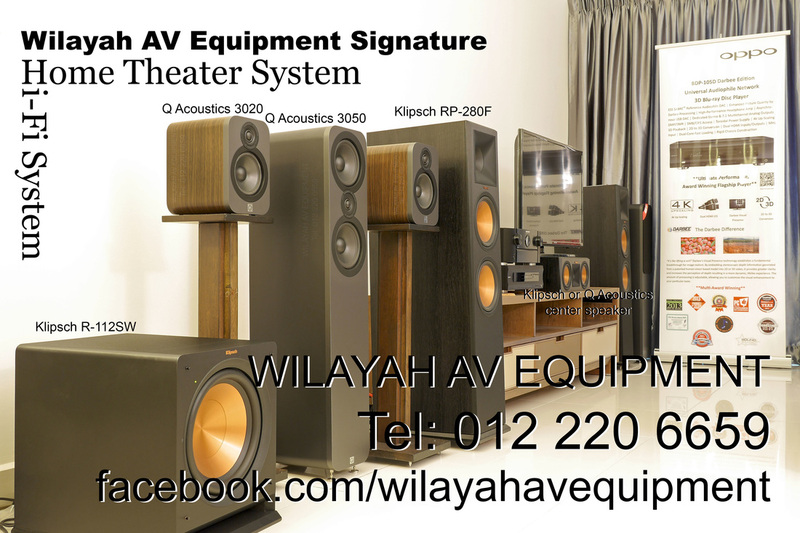 The Award Winning Q Acoustics Home Theater System is available in Wilayah AV Equipment.